Libya (136th) ranks first in the world for the strength of personal and social relationships. Social networks, and the cohesion a society experiences when people trust and respect one another, have a direct effect on the prosperity of a country. A person’s wellbeing is best provided for in a society where people trust one another and have the support of their friends and family. Societies with lower levels of trust tend to experience lower levels of economic growth. Thus the word “capital” in “social capital” highlights the contribution of social networks as an asset that produces economic returns and improves wellbeing. Over the last ten years, the world’s Social Capital has improved more than any other pillar except Business Environment. Asia-Pacific has been the long-term stand-out performer, although this year the greatest gains were for MENA and Sub-Saharan Africa. Meanwhile North America and Western Europe, which have long sat well in front of the rest, have seen decline – and in North America’s case it cost them their lead in overall prosperity. Personal and Social Relationships measures the strength of bonding Social Capital in the form of personal relationships, family networks and genuine community. These relationships improve subjective wellbeing and also provide material support. 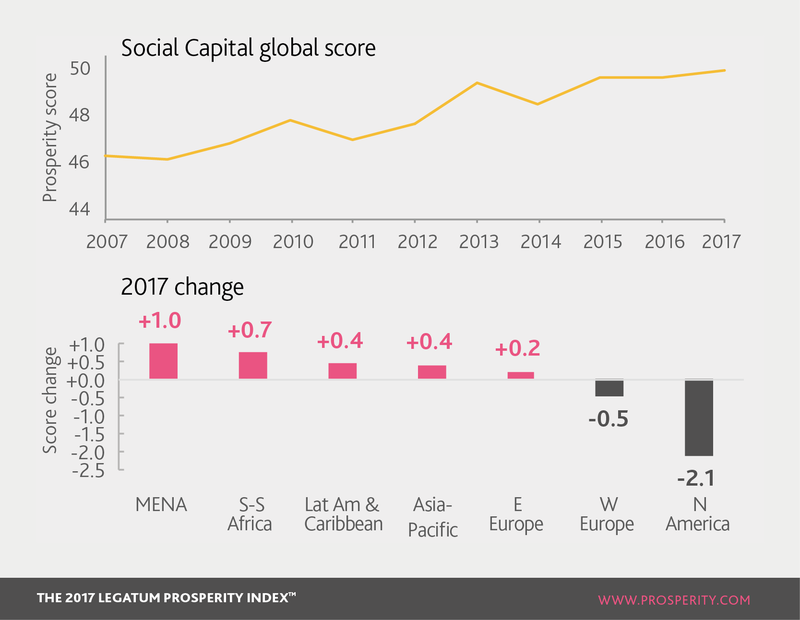 The global improvement in Social Capital over the last decade has come for the most part through strengthened personal and social relationships, particularly in Asia-Pacific. Libya rose to first in the world in 2017 in this sub-pillar due to people giving more financial help; there was also an increase in the number of people who said they had friends or family who would help them. The five countries with the greatest falls in their scores in 2017 were also in Sub-Saharan Africa – Tanzania was the worst, with a big drop in levels of voluntary financial help. Social Norms measures bridging Social Capital, which is manifested in civic norms, social cohesion and engagement. In particular, this encompasses trust in institutions (such as the police), and the level of respect people with which people treat each other. Malaysia has seen declining levels of respect and police trust, in spite of other forms of Social Capital – personal relationships, civic participation – improving in the last five years. The inverse is the case for the Czech Republic, where trust in the police has improved greatly, in spite of people’s dwindling civic participation. Civic Participation measures the linking Social Capital, which is the civic and political participation of a citizenry. These link people together, through volunteering and donating, and through the political process through political participation. Jordan has seen informal participation of its citizens grow in the last five years, through increased donations and volunteering – there are signs that the formal aspect (voicing opinions and voting) are also increasing. Chile‘s citizens are now more reluctant to engage in formal civil society than five years ago – while people are volunteering more, they are much less politically engaged through voicing their opinion or voting.